Jobu shines the light on the Dodgers’ latest phenom, Cuban masher Yasiel Puig. It’s not every year that a rookie has this kind of impact upon his arrival to the big leagues. In fact, Yasiel Puig, the 22-year old Cuban defector, has been so unbelievable that, in just his first week, he has left Vin Scully speechless and done something that no rookie had done since 1900. This kid has potential to be something special, and the people of Los Angeles should consider themselves lucky to be able to basque in his glory… Well, everyone but Andre Ethier anyway. 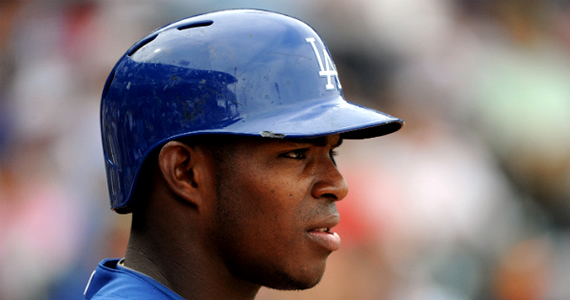 Let’s meet Yasiel Puig, MLB’s brightest new star. As usual, we’ll start with the subject’s humble beginnings. 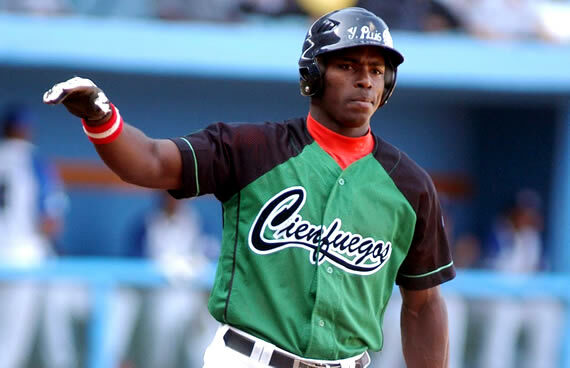 In Puig’s case, his story begins in Cienfuegos, Cuba on December 7, 1990. That’s when and where the kid was born, and it’s where he first honed his skills on the diamond. Eventually, he was noticed and was signed to Cienfuegos of the Cuban National Series. He also played internationally, earning many caps (to steal a fútbol term) with the national squad, including the World Junior Baseball Championship in 2008. He broke onto the scene during the 2009-2010 season, hitting .330 with 17 homers in just 327 at bats (thanks, wiki). After an unsuccessful attempt to defect in 2011, he was disciplined and suspended from playing in Cuba for two seasons. In 2012, he finally broke out of the island prison nation and made his way to Mexico, where he eventually established residency and signed with the Dodgers for seven years and $42 MM. That’s pretty good for a guy who’d never faced any real competition, right? Soon after that, Puig’s climb to the major leagues began. He was first assigned to the Dodger’s A- ball team in, Rancho Cucamonga, where he hit .327 i n14 games. An infection kept him from reporting to the Dodgers’ Arizona Fall League team, but he did play some winter ball when he was healthy. His development was pretty normal, unitl an invite to Spring Training with the big league club. The invite represented an opportunity, something Puig had probably been looking for his whole life, and he took full advantage. Puig hit .526 in 57 spring at bats, and nearly made the big league club. Instead, to the chagrin of many fans, he was sent to AA Chattanoga to open the season. He wouldn’t be there for very long. With Matt Kemp and Andre Ethier both injured, the Dodgers turned to Puig to try to spark an underachieving offense. Boy di d he ever. He played his first major league game on June 3, and had a pretty inocquioius start, going 2-4 with an outfield assist. The next day, he exploded. Puig homered twice, doubled and drove in five runs in his second major league game. He then homered again in his third game, an opposite field Grand Slam that turned a nail biter into an easy win. Puig had so much fun homering in his second and third games, that he decided to do it again in his fourth game, tying the game at 1-1 late. In doing all of this, Puig became the first player to hit four home runs in his first five major league games since 1900. That’s 113 years, for those keeping track at home. Overall, Puig has now played in eight games, and he’s hitting .500/.515/.938 with 4 home runs and 10 RBI. He’s played so well, in fact, that rumors of Andre Ethier’s demise have already begun (Not sure I”d be sad if he ended up in the Bronx, btw). Puig probably won’t hit .500 the rest of the way, but I can’t imagine the Dodgers sending him down after this. There would be riots at Chavez Ravine. We’ll find out in a couple of weeks. Although, even if he does get sent down, it probably won’t be for long.